We want you to enjoy your trip with Alpine River Adventures. If you have any more questions, don't hesitate to call us on 0428826938 or email riverguide@outlook.com. The best season to book? In the winter months (July and August) wildlife encounters are prolific, however temperatures can drop to below zero. In the summer months days are long and warm, and participants can swim throughout the day. If you are interested in bigger whitewater, email us and ask us for our big water dates. The Snowy Hydro scheme means we have a good idea of water levels up to a year in advance. When is the best time to go platypus spotting? In Winter/Spring, platypus need to feed more to keep up their body fat levels, and males are far more active as they establish their territory to court females during the upcoming mating season. We see many more platypus during this time, up to eight in a single waterhole. No problem, we cater for vegetarians every day. For our multi-day trips there is a pre-trip questionnaire covering medical and dietary requirements. Your trip leader will confirm numbers of anyone with special dietary needs at the briefing on the morning of rafting. Do I need to be able to swim? Do I need to be in shape? Does height and weight matter? Yes you do. Whilst participants will wear a personal floatation device (PDF) at all times in the water, we expect that participants have some swimming ability. If you are particularly apprehensive in the water you may want to consider another type of adventure. Whilst height and weight do not matter, this is an adventure activity and as such a medium level of fitness and agility is required. Some medical conditions may prohibit you from whitewater rafting/canoeing but most will not. It's very important however that if you do have a medical condition that you let our staff know prior to rafting, this is not to stop you from rafting but to inform your personal guide so that they can help in the unlikely event that something does go wrong. On all of our multi-day trips, participants are required to complete and return a medical form prior to the tour. If you require medication for your condition (eg. ashma inhalers), you will need to bring that with you in case it is needed. Pregnant women are not able to participate in Alpine River Adventures activities as there is a risk that a pregnant person could sustain a blow to the abdomen either through falling out the raft, from a paddle from another client or someone falling against them. How our rivers are graded. Can I wear sunglasses/prescription glasses? Yes you can, however we do recommend a sports strap or tie for glasses. Because of the nature of the river, we can’t guarantee the safety of your glasses so if you can do without them we recommend leaving them, along with your jewelry/watch behind. Tipping is not necessary in Australia. If you would like to show your appreciation we would be more than happy with a good review on our website, Google +, Yelp or Facebook. Can I bring my camera/video camera? A general rule of thumb is don't bring anything you would be devastated to lose. Video cameras and still cameras could get wet and most likely ruined. A good idea is a disposable waterproof camera. Photo quality is pretty good, and if you lose it, it's not the end of the world. They are well suited to rafting. What type of boat do I ride in? 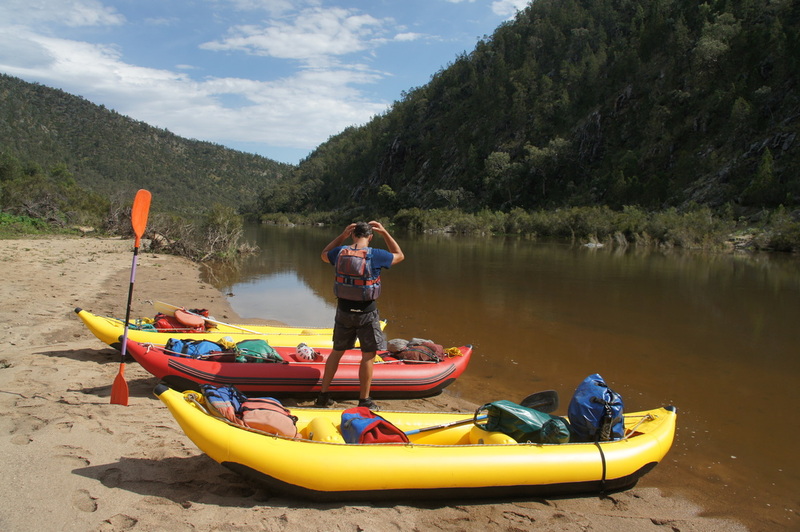 Single person inflatable canoes are used for the Snowy River 5 day Byadbo Wilderness journey. How safe is white water rafting/kayaking? Outdoor water sports are thrilling, exciting, wet, wild and unbelievably fun. However, as in all adventure sports, there is an inherent risk involved. That risk contributes to the excitement, and is one of the reasons people enjoy it so much. Our guides are trained to minimize risks, and, statistically, you're safer on a raft or kayak than in your car. But still, there is a risk, and you must accept that risk when you go on the river. The most common injury is sunburn, and most other injuries occur on land, especially getting into and out of the boats. Do I need rafting/kayaking experience? No you don't. Everyone can enjoy our kayaking and rafting experiences. You will be given training and a full safety briefing before the trip starts. All of our qualified and certified guides will be able to give you any extra personal instruction you may need on the day.